Why Should You Become A Med Tech? Medication aides assist clients who have cognitive impairment, are disabled, and or ill with managing their medications. 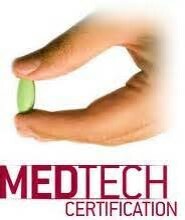 Most Medication Techs work for assisted living facility or home care agencies. documenting and preparing the medication. Monitor clients for adverse effects or side effects. Assist clients with ordering refills on prescribed medication. Communicate with clients medical team regarding medication concerns. Trained by experienced Registered Nurses.